The Lakewood Ranch community continues to expand and this time into Sarasota County. Waterside will be Lakewood Ranch’s first village in Sarasota County, and will have a Sarasota address. 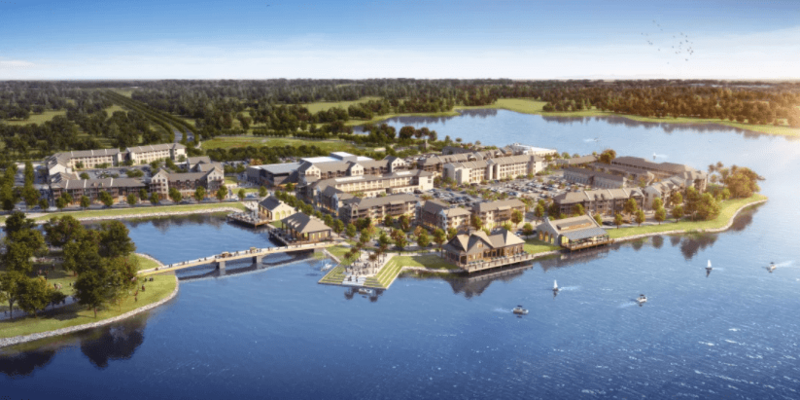 With the introduction of its newest village, Waterside will have an eventual 5,144 homes set on 5,490 acres—nearly 4,100 acres of it made up of seven large lakes with more than 20 miles of shoreline—south of University Parkway. Two home builders are already turning earth on their Waterside communities and sales will begin this summer. The community will be made up of 12 interconnected neighborhoods of more than 5,000 homes built around seven lakes, featuring nature preserves, a waterfront park and a trail system. It will also feature a village center that will include restaurants, shops, offices and a performing arts center. The Players Centre for Performing Arts will also be building its new complex at Waterside Place, Waterside’s village center. The nonprofit community theater plans a 480-seat mainstage auditorium, a 125-seat black box theater, a 100-seat cabaret and an educational wing. It will be built in phases; when completed, Cole says, 600 events a year are anticipated to be presented there. Already this summer, The Players Centre has introduced STAR: Storytelling Theatre at the Ranch, with monthly performances of plays aimed at young children, held at the Sarasota Polo Club clubhouse.